Q: How can I be of help to the world? John: By being in your heart, being in your heart unconditionally, without any focus of results. If you’re being in your heart to help this world, you’ll be distracted by your need to help, or your openness to help this world. You’ll be distracted from a depth of your heart that you haven’t awakened to yet. Your reach outside of your self into this world is completely dependent on your reach within. When your reach is within, you won’t have anything in view that’s in your self or even outside of your self. Initially when your reach is within, you’ll be gentled and quieted in your heart. When you are gentled and quieted in your heart, you’re at the doorway, so to speak, of your own being. That gentled-ness and that quietness in your heart, where you are as awareness just simply opening and softening in your heart, that kind of beingness makes you as awareness the same as your own being. Without you being the same as your own being, whatever you’re representing outside of your self won’t be a representation of your being. It’ll be a representation of your self, the views in your self, the sincere views in yourself. For you to be of any help – any profound help in this world – you would need to come from not just your heart, but deeper within from your own being. This world is polarized. Our selves are polarized. Both are conditioned. When you are completely opened and softened in your heart, you’re not relating to any kind of polarization. Where there is no polarization in your quieted beingness, you’re at the initial levels in your being. From there it goes deeper and deeper and, like a tree, your reach outside of yourself is limited to the development of your own roots, your unseen roots, the roots that are out of sight beneath the ground, deeper than your experience. An easy way to relate to what is deeper within than your self, your past, your person, your experience, is when you lie down to go to sleep. When you first lie down, you’re lying down together with your past, your experiences, everything that you’ve carried about in your day. At first you lie down as a person and as soon as you begin to relax, your personality and its movement begins to rest. As you, awareness, relax you open and as you open everything that you’re accustomed to in your day, what you’re accustomed to relating to begins to pass away. Your own conditioning in yourself passes away, and you naturally come into your heart. As you, awareness, continue to open and fundamentally relax you go even deeper within than your own heart. There all of the forms of familiarity you’ve gone beneath. As you have receded out of all of your familiar forms, you fall asleep. You’re returning to an unconditioned restedness: an unconditioned relaxation, a repose into your own being, into what you really are. Right at that point, you fall asleep. Each time that you lie down to go to sleep, notice what’s occurring in you; notice what falls away. Everything that falls away, that passes away, that relaxes away from your experience enables you to realize what it is that actually matters most; that you’re coming into your own real unconditioned beingness. It has all to do with quality and depth, not conditioned by familiarity. What you’re left with as everything passes away shows you how to be, how to be within in the midst of your heart, your self, your person, your life, your past, your conditioning, your whole day. As you connect with what you really are in the midst of everything that is yours in your day, you are being what everyone is looking for by simply being that. That’s your most fundamental help. That’s a first help to others, because there, the resonance of what you’re being and what you are in the midst of all of your forms in the midst of your day, is the same as your own being and others read that: children read that, babies read that, nature and animals read that. It matters more than your words. 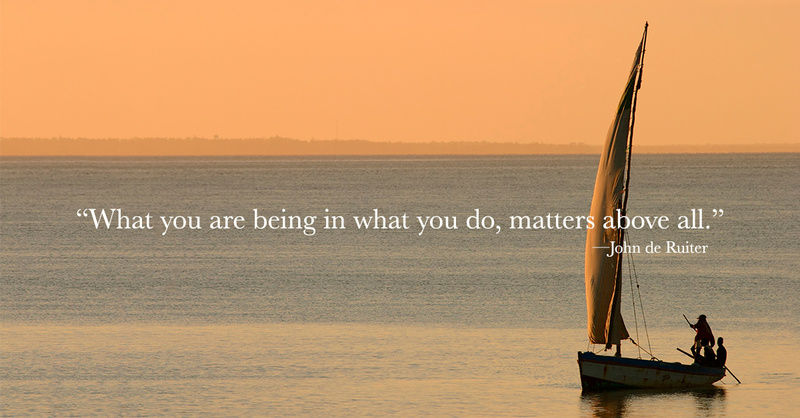 It matters more than your intentions. To listen to John de Ruiter Podcast 225 – Being of Help in a Polarized World or see all the John de Ruiter Podcast Episodes.